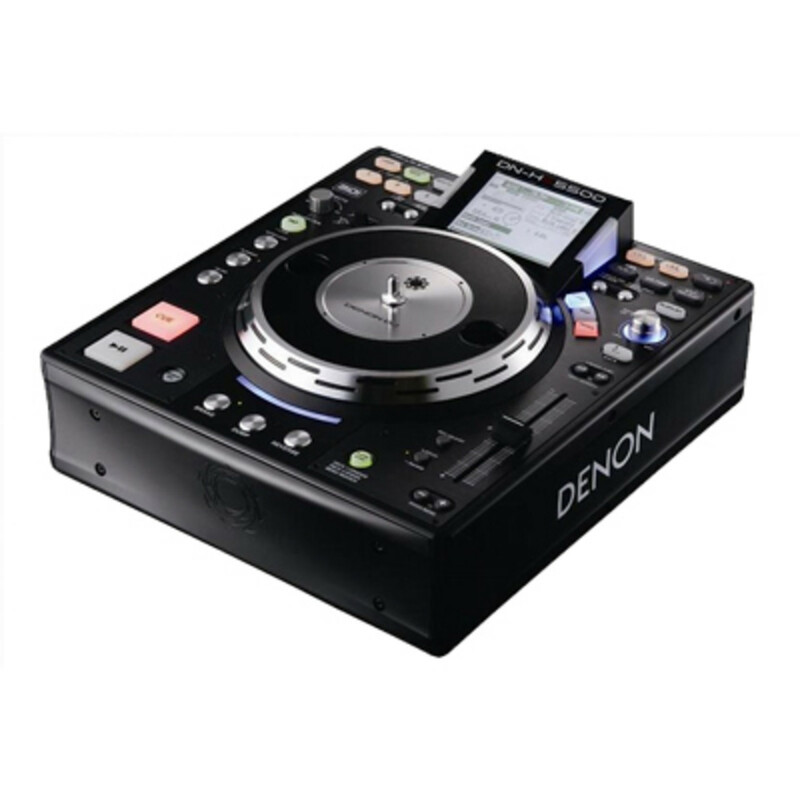 The Denon DN-HS5500 is the Flagship direct drive media 2-in-1 controller that has so many features that it must be in a class all by itself! The Denon DN-HS5500, a Direct Drive Media Player & Controller. This deck has several features. Some of them being 2 Decks in 1, an internal HDD option, High Torque Direct Drive Motor with real analog TT feel & control, USB MIDI interface, D-Sync, USB Audio Interface which supports external USB Hub. It also has an 8 way of navigation system, 9-Onboard effects, 2 hot starts and seamless loops, and more. I use this deck myself, and I have not seen a deck with as many features as this one. 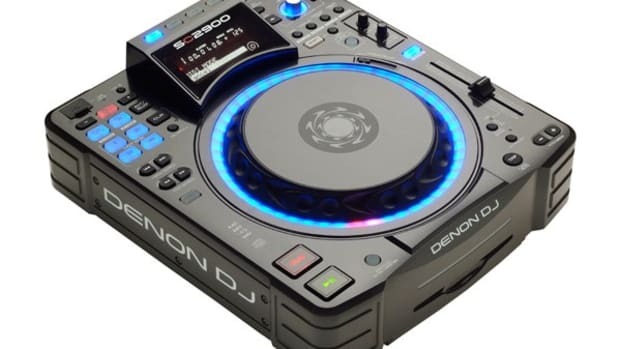 I think demon really did the job well and this deck is definitely the one to have regardless if you are a club or mobile deejay. One of these decks is all you need; you do not need two like any other single deck out there today. The 2 Decks in 1 feature do it all. This is actually what made this deck outstanding, so here I am doing this review. My first impression on this deck was amazing. When I first took it out of the box I could already tell how well the deck was built. The black outer casing of the unit feels like a super-hard/heavy duty plastic. The platter itself is very solid. The placement of the controllers (play, cue, pitch, effects, hot starts, etc) in my opinion was placed in the best way possible. The buttons are very fixed and solid with a click-push feeling. In the front of the unit there is no CD drive. Yeah I really meant to say NO CD drive, this unit is the “feature” of deejaying. It only uses USB ports. The rear of the deck contains TWO RCA Line outs and TWO digital outs. D-Link RJ45 input to connect two units. It contains USB ports. Of course an ON/OFF power button and a power cord also attached to the rear of the unit. What about the platter? Well the platter is a 7 inches platter. The platter itself is all metal construction. The motor of the platter is a very powerful Direct Drive, high-torque unit which is capable of being adjusted using different presets. The platter can be used for different things such as scratching, pitch-bending, and search. 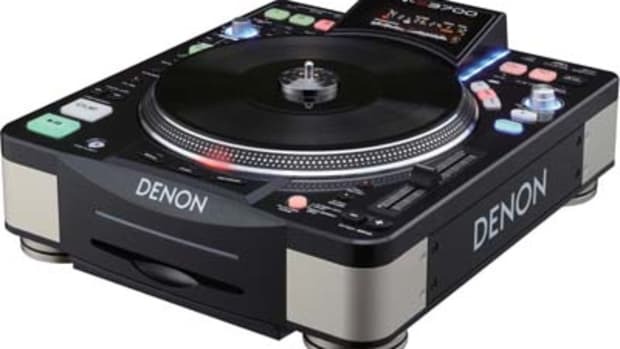 It’s not like the Denon DN-S3700 that has a bigger platter and a better feeling but you still can pretty much do the same thing, with the same quality. I believe this unit has the BEST display. I haven’t seen a deck with a better display, including decks from Pioneer, Numark, Gemini, or even the new Denon DN-S3700. The design of the display is the best one possible! It is angled towards you so it is easier to see and you don’t have to be bending over to see the unit information. The Display will tell you what you need to know from track information which includes artist, genre, and album. It will also tell the BPM, deck number, pitch, time remaining, timeliner, which will you how far you are in a track, if you are using an effect, it will show the effect information, and the edit ability of the effect. It might seem a lot of information, but it really isn’t. Everything is very organized, and easy to understand. There is also a button you can press to divide the display screen into two for the use of the two decks feature, meaning you will be able to see information from both “decks” by dividing the display. This is very useful when mixing two songs and to see the BPM from both decks. I will explain better about this button and where is located in the next couple paragraphs. This deck has everything any other deck has + more features. For example the CUE button. It is adjustable to work however you want. It comes in Normal mode, which the cue point is set at the start of the play/pause mode. 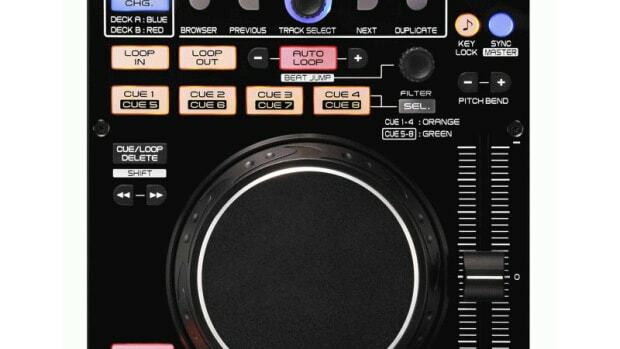 However you can change it to work like the Pioneers CDJs, which the cue point is set whenever the CUE button is press during play mode. The Play/Pause button is made with a soft rubbery material, and so is the CUE. In the lower section of the deck there is three buttons: the brake, dump, and reverse. This feature is found on most Denon CD-Players which is very useful. The brake feature does just what it says; it is an “effect” to stop the music you are playing. It is adjustable by using the parameters knob to make it longer of shorter. I do not really use the dump feature but it is used to reverse sound without losing true forward time, like a radio edit. And there is the reverse effect which does it what it says: it plays your music backwards and the cool part is that the platter spins backwards too. In the left side of the unit, on top of the play/pause & CUE button there is 3 buttons that are used to control 5 built-in effects. The first one from bottom to top is the Filter (High-Mid-Low). The one in the middle is the Flanger. The top one is the Echo (Tail Echo-Echo loop). Above the 3 buttons you have the TAP button. This button is made with a soft rubbery material. It is used to control the BPM of the Track. Above the TAP, there is the EFFECTS Knob. This knob will control how “dry” or “wet” the effect is. All the information from the effects can be viewed using the display screen, just like basically the whole unit. Everything you do, most likely will appear in the display. A feature that I forgot was a feature between Play/Pause button and the 3 Platter Effects (Brake-Dump-Reverse). It is the Mirror Mix. It is an exclusive feature from this unit. You probably will not find in anymore other deck, at least I didn’t… It is just like having two copies of the same track while juggling the mixer’s crossfader back and forth with the other track being slightly delayed. The Delays settings are also adjustable. I personally don’t use this feature a lot but I think it’s cool and for some deejays it might be useful. Now going to the right of the mixer, there is the Platter Source button. This button has the same material as the play/pause, CUE, and Mirror Mix buttons. What this button does, it lets you change from search mode and play mode. In search mode while the track is on cue or pause mode it will let you search to create a cue by moving the platter. In the other hand if you are playing a track and you are on search mode, by moving the platter it will let you temporally bend the track (make it faster or slower). Moving a little down to the right there is 2 buttons with a + and – on it. This is the pitch bend buttons. What this buttons will let you temporally move speed the track up or slow the track down, similar to the search mode when the track is playing. For me the pitch bend buttons are very useful. I use them quite a lot to beat-match and they work perfect. Now let’s move on to the Pitch. The Pitch Slider is in the right hand side of the unit. The pitch has a zero-click which will let you know that you are in the “original” BPM of your track. This is useful to me because it will let me go back to 0% easier. The pitch is also adjustable, just like the whole deck. It is adjustable to 4%, 10%, 16% and 24%. Next to the pitch slider there are 2 little buttons that are the key adjust and the pitch (-range). Key Adjust lets you adjust the speed of the track but it will not change the key of it. The button under that one is the pitch (-range) button. This will turn your pitch slider on and off. Above the Pitch Slider there is the 2 search buttons. You use these buttons to fast forward or backwards your track. The Fast Search is adjustable and you can change how fast forward or backwards you want to go. Okay moving on… On your right hand side of the unit you will see 3 buttons; D-Sync, Midi, Device. 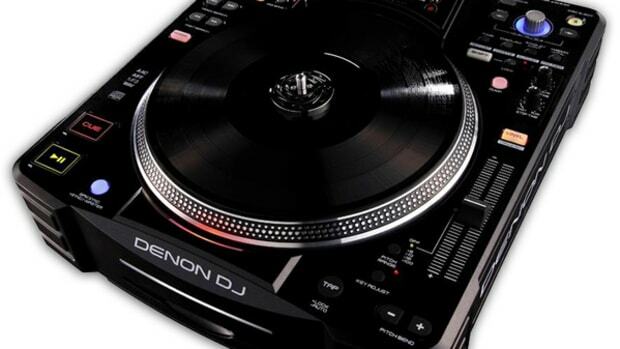 They are made with the same material the Play/Pause, Cue and other buttons of the deck is, a soft rubbery material. The first button: D-Sync is used to connect two Denon DN-HS5500. MIDI button is obviously to connect to a MIDI device, and the Device button is for you to connect to your USB ports. Next to these buttons there is the “main” command knob the: PARAMETERS Knob. This Knob is where you will control everything on your deck; Select the tracks, search thru folders, control the effects and some other little things. Under that there is the BACK button, also made with the same soft rubbery material. This button is use to return to previous screen. Above the PARAMETERS Knob and the BACK button there is the PLAYLIST button. This button is made with the same material the BACK button. It is used to go to your playlist, created using the software it comes with the unit. On the left of the PLAYLIST there is 2 little buttons; TITLE/ID3 – C-FADE and CONT/SINGLE, - RELAY. The fist one: TITLE/ID3 is to change the way the date of the track is displayed. This button also has a second function which is to turn the cross-fading on and off. The CONT/SINGLE, - RELAY is used to change the 3 possible END modes for playback. The 3 modes are: CONT. SINGLE and PLAYLOCK. On the top right hand side of the deck there is the HOT START/LOOPING section. There is 3 buttons made with the soft rubbery material. They are: A1, A2 and B. The first two buttons (A1 & A2) you can create starting point for Hot Start, Seamless Loop and Stutter. Next to them, there is a button shaped the same way called B button. This is used to set the B point for to create a Seamless loop playback. Under that there is the EXIT/RELOOP button. Used to exit or return back again to Seamless loop. Also in that section there is the FLIP/CLR button. This is to select operation mode of A1 and A2 buttons. This button will also clear the Point you made using A1 and A2. All you have to do is; hold it down for more than 1 second. Now going all the way to the top left side you have an area with 3 buttons. All 3 buttons are made with a soft rubbery material. The first one on the left is the LAYER 1 button. This is used to change between the 2 deck options. Next to that you have the DISPLAY MODE button. Used to change the way you see the display screen. Next to it, there is the NEXT FILE. This button is used to select another track before the one playing stops. Under that you have the HOT LIST section also with 3 buttons. They are numbered 1, 2 and 3. The 1 button is to register files on the hotlist. The 2 button is to mark files on the hotlist as already having played and to delete files from the hotlist. The 3 button is to start and stop the mirror mix operation. Part names and Functions: Still on the left hand side there is a Scratch layback direction selector lever. This is to select the direction of scratch playback. You have 2 options from BOTH; will be able to scratch going forward and on the reverse direction. FWD; only will be able to scratch on the forward direction. Above that there is the last 2 little buttons. They are the TIME – UTIL and MEMO – PRESET. These are basically where you are going to change the entire configuration on the unit. The first one; TIME – UTIL is to change the time indicator. When you are on CUE Mode, if you press it down and hold it, it will pop up on the screen tons of info regarding the track, hot list, and some other stuff related to files. At last there is the MEMO – PRESET button. The MEMO mode starts when this button is pushed once in the Cue Mode. If you hold it down for a little while (on CUE mode) it will also pop up on the screen tons of information about the unit. I think I talked about the whole unit and its functions. In my opinion there is not a single deck out there today with the functions this deck has. There is no other deck with the 2 in 1 deck function with all the options you have with this unit. I currently use this and I think this is the right deck for anyone, including beginners, pro deejays, and mobile deejays. Actually this is the best unit for mobile deejays; taking in consideration you only need one deck. I only have 2 problems with this unit, one of them being a problem with all Denon units. When you have a really high base sound and you have a vibration near the unit, the unit will lately go crazy. It won’t respond correctly and most likely you will have to turn the sound down or put something under the unit to reduce the vibration. The other problem is not coming with a CD-drive. I think it’s just ridiculous a player with all these functions not have a built in CD-Drive. Besides these two problems I think this is a great player, I highly recommend this unit, taking in consideration the unit price and features, so if you’re looking for a good CDJ, this is the right one for you. 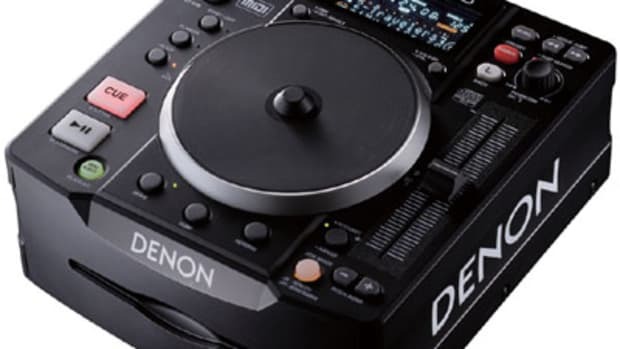 After teasing us with a few shaky promotional videos and news articles, Denon DJ has finally (and officially) announced the Denon SC3900 Multi-Media USB MIDI controller. This new controller boasts iPod, CD, and USB slots for playback and can be used as an all-out MIDI controller with it's buttons and sliders being fully mappable for a Computer DJ's needs. 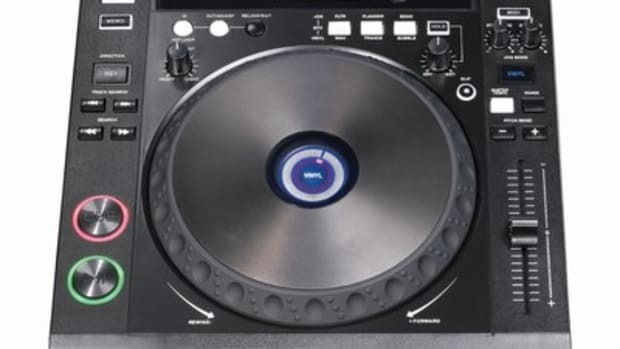 The 9-inch actively spinning platter makes the S3900 a top-choice for hip-hop and Scratch DJ's and timecode can be used without the use of CD's. Check out the press release inside for all the specs. UPDATED WITH VIDEO!